LEGO® WeDo Robotics PLUS Scratch Video Design Camp-“Scratch” Computer Programming from M.I.T. Campers gain hands-on skills in building, coding and robotics through projects with a Pokémon and animal theme. 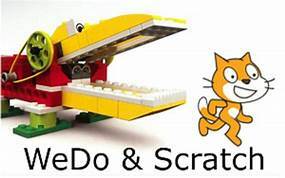 Build Motorized and Robotic Creatures: Students will build creatures that move, and learn how to control motors, activate sensors and program instructions with code blocks using LEGO® WeDo software. Projects include a walking robot dog and motion-sensing Venus fly trap! Campers also build motorized projects such as Bunnelby, the hopping rabbit, Toothless the dragon, and the Bulbasaur Pokémon. Create Games by Coding: Design three fun Pokemon or animal-themed computer games while learning coding fundamentals. You’ll learn about loops, if/else statements, logical operators, and variables using Scratch®’s code blocks, the perfect introduction to the world of computer science. You’ll even make a soccer game with animal characters controlled by mouse movement! And, the best thing is that you can take home your games to play with friends and family on any Windows or Mac computer. Team Activities: Broaden robotics skills with a team project experience – programming the Sphero robotic ball to move through a maze to catch a Pokémon! The ball, with its gyroscope and lights, matches a pokeball and the students work as a team to code in some creative actions and personality for it.